We invite children of up to 6 years and their parents or guardians to come sing with us in English and German! Our 45-minute classes involve singing songs in both English and German, using simple instruments, meeting some wonderful families and making new friends. In addition to making music and playing games, we will also sing traditional folk and children’s songs from both cultures, some of which you may want to take home and sing as a family. We will sing, dance, play and laugh! Come join the fun! We will explore two different cultures in a musical and artistic context, focussing on making music and discovering commonalities in a low-stress, cheerful environment. Your children will hear the sounds and rhythms of both the German and English language. This music circle is aimed at all families. Wherever you are from, you are welcome to come and sing with us! We look forward to meeting you and making music with you and your families. Emma Davies is a performing musician (voice/cornet/guitar/percussion). She has many years of experience teaching music to children. She is a native English speaker. Britta Robyn is a native German speaker. 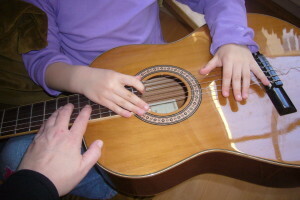 She is a music therapist, as well as a teacher of German and English. When: Mondays at either 4.15 pm or 5 pm, for 45 minutes. Our next course starts on 11 February. Cost: 80 euros / child / 8 weeks. Siblings can take part for half the price.